A former Dallas Cowboys football player will make history this weekend when he becomes the first ever NFL player to marry a man. 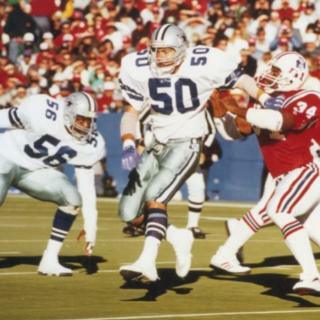 Jeff Rohrer, a former linebacker for the Texas American football team, publicly came out as gay on Wednesday. “If I had told the Dallas Cowboys in the 1980s that I was gay, I would have been cut immediately,” Rohrer told the New York Times. Rohrer, 59, will marry his partner of three years, Joshua Ross, 36, who grew up near the Texas stadium where Rohrer used to play throughout his professional sports career in the 1980s. Three decades later, Rohrer has gone on to become a successful director of TV commercials. His partner is a famous skin-care expert and aesthetician from West Hollywood, who appeared on last season’s reality TV programme, The Real Housewives of Beverly Hills. LGBT sports website Outsports reports that 11 NFL players have come out as gay – no-one during their professional career. Only eight ever played in a regular season game. “I’ve given at least five people heart attacks with this news,” Rohrer told the Times. He said that one friend returned his wedding invitation because he “actually thought it was a joke”. “People are floored. I guess I was a really good actor,” he said about all his years hiding his sexual orientation. Before meeting Mr Ross at a tequila bar in West Hollywood in 2015 he was “completely in the closet,” he says. “And if not for Josh, I’d still be in there,” he said. Mr Ross recalled seeing “this big, gregarious guy sitting there, though I wasn’t sure if he was gay”. The couple will tie the knot in an elaborate ceremony Los Angeles on Sunday.